"He peered sideways up and gave a long low whistle of call, then paused awhile in rapt attention . . . Two strong shrill whistles answered through the calm." What is happening here? Mulligan seems to be wryly, apishly sending a request up to God in heaven (the “old chap” of the following paragraph), and, astonishingly, receiving confirmation in the form of a quite audible reply. Has the mock mass suddenly turned seriously successful? In "Preparatory to Anything Else: Introduction to Joyce's Hades," Journal of Modern Literature 24: (2001): 363-499, Robert Bell articulates the most plausible explanation: Mulligan "expects that at this time every morning he will hear the whistle of 'the mailboat clearing the harbor mouth of Kingstown'" (369). If the mailboat announced its departure from the harbor with a steam whistle, this would account very well for the "strong shrill" quality of the blasts. Knowing that he can reliably predict this aural phenomenon (the mailboats were rigorously punctual), Mulligan has practiced his summoning of the sound as a parlor trick to demonstrate his intimate communication with the Almighty. And, as Robert Nicholson points out in The Ulysses Guide: Tours through Joyce's Dublin (New Island, 2015), he would be able to rely on a visual cue to time his prediction exactly: "the jet of steam in the harbour would have been visible a couple of seconds before the sound reached the tower" (19). Thinking less realistically, commentators have searched for symbolic parallels to the two whistles that Mulligan receives from the ether. Gifford notes that the server in the Mass rings a handbell to announce the moment of consecration of the host, when, as the celebrant speaks the words, “This is my body . . . this is my blood,” transubstantiation occurs. 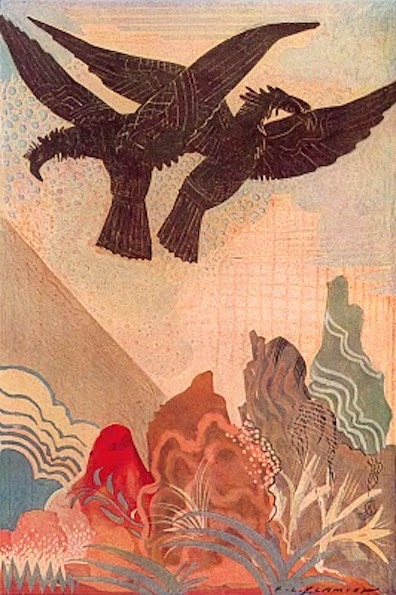 Jorn Barger notes a resemblance to the passage in Book 2 of the Odyssey in which Zeus sends two eagles into view in the sky as an encouraging sign to Telemachus that his father will return to wreak destruction on the suitors. Neither supposed allusion seems definitive, but they do augment the impression of divine approval. Odyssey: The Two Eagles of the Omen, medium unknown, by Rod Dreher, published online 2012. Source: www.theamericanconservative.com.